Cholesterol and lipid metabolism used to simple. There was good (HDL) cholesterol and bad (LDL) cholesterol. Eat a diet low in cholesterol and fat and your blood vessels will be as open as a new straw. On the basis of very little solid scientific information a litany of assumptions was issued by both the medical and lay press. As is virtually always so, when cooler eyes were cast on the association of lipid metabolism and cardiovascular disease the relationship proved more complex than the initial sets of breezy assumptions. A paper in the May 18, 2017 issue of the New England Journal of Medicine presents additional data that go against the grain of our thinking about lipid metabolism and CVD. 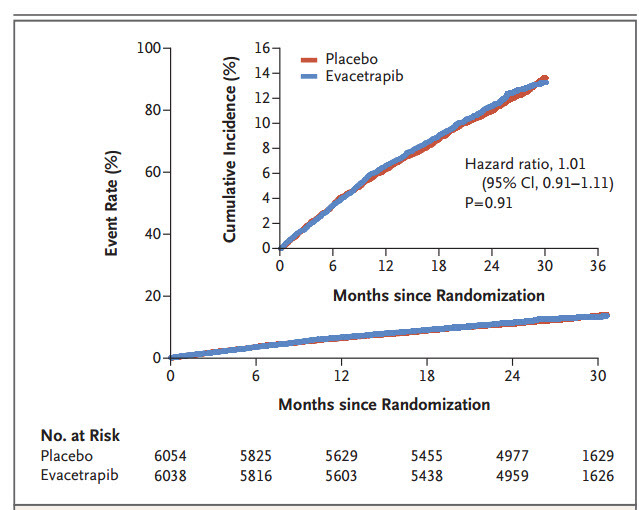 Evacetrapib and Cardiovascular Outcomes in High-Risk Vascular Disease by Lincoff and a posse of collaborators sought to examine the effect of evacetrapib on major adverse cardiovascular outcomes in patients with high-risk vascular disease. This drug inhibits cholesteryl ester transfer protein and thus substantially raises the high-density lipoprotein (HDL) cholesterol level, reduces the low-density lipoprotein (LDL) cholesterol level, and enhances cellular cholesterol efflux capacity. 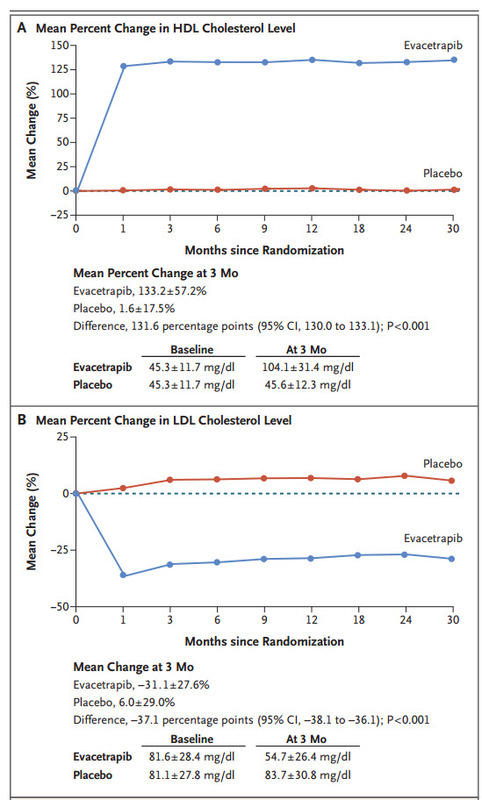 The figure below shows that the desired changes in both HDL and LDL cholesterol were achieved. According to conventional thinking these changes should have had beneficial effects on the treated patients compared to those who received a placebo. The graph below compares the occurrence of any component of the composite of death from cardiovascular causes, myocardial infarction, stroke, coronary revascularization, or hospitalization for unstable angina in the time‑to‑event analysis between the drug and placebo groups. As is obvious there is no difference. The cumulative incidence (inset) is the percentage of patients in each trial group who had at least one primary composite end‑point event over the course of the trial. Again there is no difference. As is typical in medicine, we often know less about the pathophysiology of a disease than we initially thought. This study is another example of why medicine consists of making important decisions on the basis of inadequate information. Sounds like trying to shut the barn door after the horse has escaped. Or maybe chasing the wrong villain..